The MiBed adjustable beds offer unique support to different areas of the body and can help relieve aches and pains. Supplied with an 9" deep 1000ct pocket sprung mattress. Max user weight of 18 stone and is SOFT/MEDIUM feel. Base available in 6 sizes and 4 fabrics as standard. 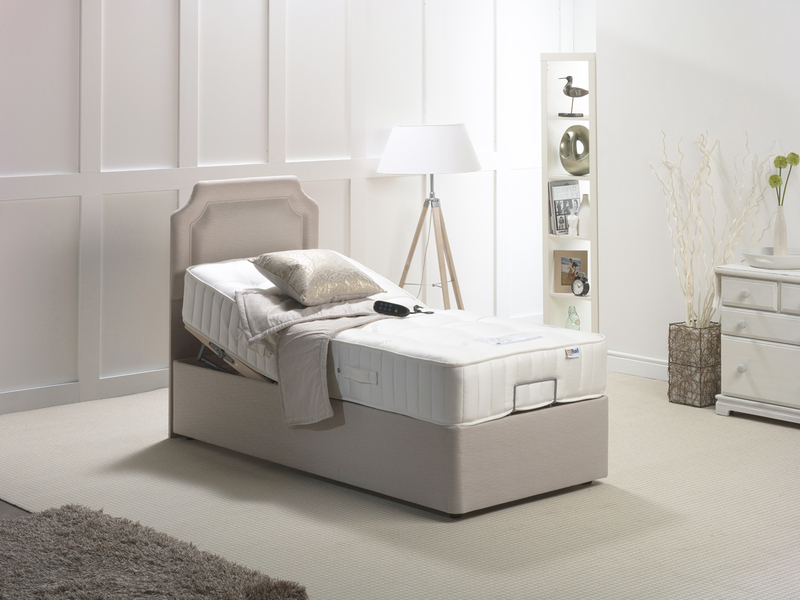 The MiBed range of adjustable bed bases offer a unique, customisable support to different areas of the body which can help relieve minor aches and pains and can help with back pain, arthritis and swollen legs. They also promote better circulation by allowing you to adjust your sleeping angle. The MiBed mechanisms are robust, smooth and quiet with built-in safety features that comply with the highest UK standards. Featuring a 5 part 'K-Frame' and sprung beech slats as well as a new ergonomic handset. The bed bases are also easy to manoeuvre as they are fitted with twin wheel castors. The bed is available in six different size options - 2'6, 3'0, 4'0, 4'6, 5'0 and 6'0. If you choose the 5ft or 6ft option then you will be supplied with two separate bed bases measuring either 2'6 or 3'0 depening on which size you choose. Four coloured fabric options available as standard - Coconut, Iron, Wheat and Barley. The bed is supplied with an 9" deep 1000ct pocket sprung that features a quilted cover for added comfort. The mattress is suitable for users up to 18 stone and has a Soft/Medium feel. We have arranged for a full delivery and installation service to be provided to you when you purchase any of the MiBed range of beds. Delivery will normally take approximately 2-3 weeks and you will be contacted to arrange a suitable installation date.